5322 Miley Road Plant City, FL. | MLS# T2888972 | Vogel Realty Services, Inc. | Expert Broker & Realtors Connecting Buyers & Sellers FAST | Central Florida Serving Plant City, Lakeland, Brandon, Valrico, & Tampa Florida. SHORT SALE: A WHOLE LOTTA LOVE... Can be shared by your family inside this generously sized 2856-SF easy care, 3 BEDROOM, 2 BATH, CB home in the CORK area of Plant City. 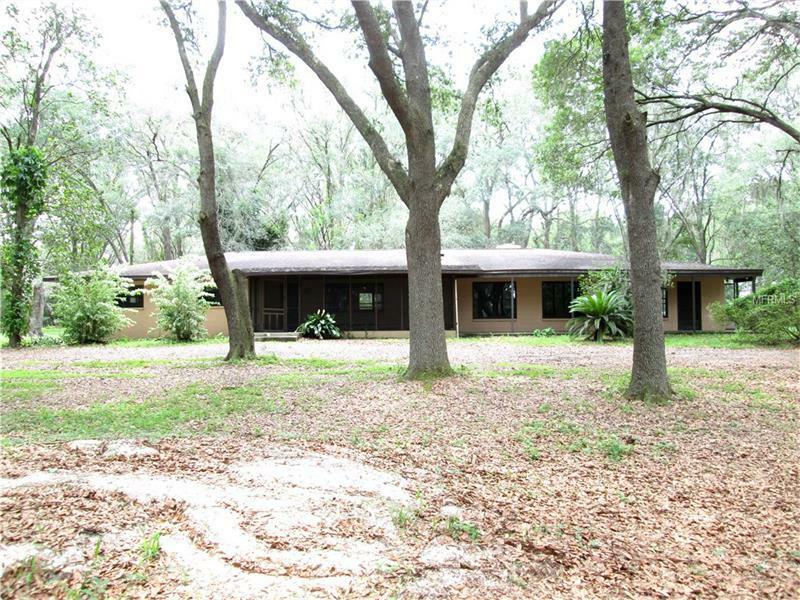 Take refuge on the 4.85 acre site while the home is nestled under canopy of beautiful oaks, surrounding the property. Check out the room sizes in the living areas of this home! ENTERTAIN or just enjoy family life, THANKSGIVING will be here in the gracious 14X20 dining room with BUILT IN FLOOR TO CEILING RETRO-HUTCH for your formal dishes! FAMILY ROOM offers whole brick wall with fireplace. Most of home has new carpeting. LOTS OF EXTRAS - 2 separate in-law suites on property, provide plenty of space for this SPACIOUS FAMILY PLACE. GIVE YOURSELF A BONUS - in the 15X29 FT BONUS room! BARN and STALL, HUGE CB WORKSHOP or GARAGE for TINKER DAYS. Bring those rocking chairs and RELAX on 16X36 REAR screen porch, Wile away the days on 07X39 FT front screened porch! Well is 200 FT deep, 2 HP submersible pump. Lot's of wildlife on and surrounding parcel, This property is GORGEOUS!